It was one of those nights you never forget. The pounding was unrelenting. Wind, rain, lighting, thunder…all seemingly at war with each other whirling around in a mad cosmic chase which ripped at my very core. It was all I could do to stay anchored to my footings. I remembered when the builder had laid them down. He was an honest man who took real pride in the five homes that he built every year. Not one to cut corners, he had personally inspected every step of the job, forcing workman to complete the job to his high standards even when they complained that the delays would cost him dearly. It was his reputation on the line and he cut off their protestations with a fierce look. The foundations for the house across the street had been dug shortly after my builder got started. Yet amazingly, it had been completed ahead of mine. Causing just a little grumpiness for my homeowners. I couldn’t see everything the crew was doing, but they worked fast…mighty fast to get that house ready. Perhaps too fast. It was hard to see clearly through the inky darkness, but several shingles whipping by my roof line indicated that all was not well. I heard several large crashes and then there was silence. It was as though the wind and rain had simply spent themselves into a muted, angry truce a they ran out of steam. I couldn’t examine the damage until the sun came up the next morning. I’d lost a few shingles, but overall I was fine albeit a little creaky. A few large branches littered the otherwise pristine lawn which now gleamed with the brilliant green that accompanies a thunderstorm. Across the street however, a scene of intense devastation was unfolding. Large portions of the roof had been whipped off and an entire corner of the home had simply crumpled into the ground. The foundation wall had shifted and the home looked as though it might topple over at any time. A crowd of concerned onlookers was gathering to survey the damage. My thoughts drifted back to the wise builder who had had taken such detailed care in laying my foundations. I used to hear him telling his workers that they needed to build as though they were building their own home. In fact, he often refused to build on certain lots when he felt the underlying terra ferma would not be rock solid. Unstable, shifting soil was a guaranteed non starter when it came to undertaking a building job. I was thankful for the attention had had paid to making sure I had a stable foundation today. I had survived the storm because of it. I had been buffetted by wind, trounced by the rain and beaten silly by the storm, but I had not failed because of a formidable foundation. Foundations are what anchor us to the earth in a solid fashion. They’re not glamorous. It’s about the basic building blocks of life..and business. The follow-up and follow-through. The simple doing of what you say and delivering beyond expectations. It’s about the phone call, note and thank you card. Foundations are what ensure that you don’t forget who you work for. They remind you that every part of the process in life, relationships and business is another nail which holds together the priceless treasure of a good reputation. 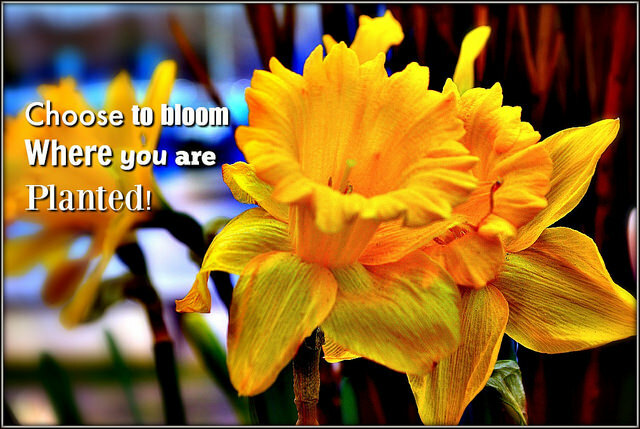 Choose to Bloom – No Matter What! The truth is that I would prefer to choose where I was planted rather than where I bloomed. But life’s not wrapped up with a shiny bow like that! In fact, many aspects of life are not chosen. We don’t get to select our parents, our skin color or place of birth. Things which turn out to be pretty significant in life. However, we do get to choose our responses. Free will is one of the greatest blessings or curses depending on how you look at it. As 2017 has already started emerging on the planet, we stand at a new threshold. 2016 has revealed some of the ugliest underpinnings of the human experience both domestically and abroad. A New Year presents new opportunities to make new choices. We can’t always choose where we’re planted, but we can make a decision to bloom anyway. To speak with each other again.